With UCLA Basketball in a rebuilding year, having lost 5 key players to the Pro’s, it’s hard to get too excited about the prospects for this season. It got even harder, when the Bruins lost last week to unranked Oklahoma, and then got schooled by the school where players don’t have to attend school North Carolina (who now has 2 losses). But that doesn’t mean that you can’t root your heart out for OUR boys. UCLA has shown some flashes of talent, while cleaning the clocks of the cupcakes and creampuffs on their schedule like Cal State Fullerton. 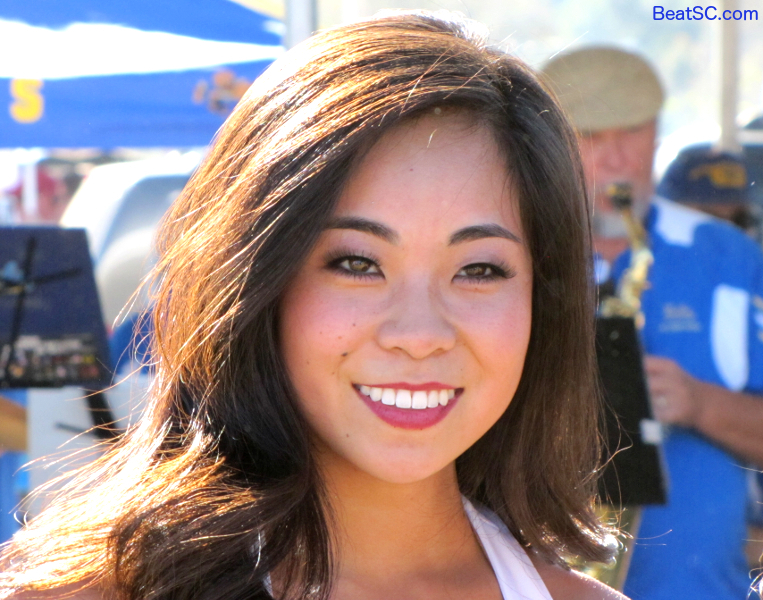 The Bruins cruised against CSUF, going up by 17 at halftime, and using a 13-0 second-half spurt to win going away. UCLA is playing a fun and entertaining brand of basketball. They run the floor, they emphasize transition, they shoot the ball quickly, and they maintain a great pace for 40 minutes. Most importantly, they SHARE the ball. This fact is demonstrated by their balanced scoring, as the starting five often ALL score in double-figures. Bruin fans also have the privilege of watching one of the Country’s best Freshmen, in Kevon Looney, who so far leads the whole Nation in Rebounding. Looney has a knack for knowing where the missed shots will go, and with his impressive wingspan, he seems to get twice as many as anyone else on the floor for either team. The rest of his game is also solid, and getting better. But not since DePaul in the 70’s has FIVE GUYS been enough to win at this level. Unfortunately, due to some unforseen circumstances, the Bruins lost two players before the season, leaving them with a bench thinner than onion skin. For example, even in an easy blowout against the cupcake du jour tonight, the main bench players combined to shoot 2-14, with 2 Turnovers. The Bruins will not go far this year with that kind of bench support. I don’t mean to insult these guys, as they all have talent and potential to be major contributors… some day — Just not really soon. The other problem is Defense. The Bruins will not be able to stop a good team from scoring. When they play man-to-man, individuals get exposed, and when they play zone, they fail to close on 3-point shooters. In the Howland Era, the Bruins had a tradition of almost always shutting down the opponents’ best weapon. So far this year, in the two losses, the main guy to shut down was not shut down. The one thing the Bruins DO have on D is length. With Looney inside, and other big men rotating, the Bruins now have a second line of Defense, able to block shots when foes penetrate. That bodes well for the later part of the season, when the perimeter Defenders get more experience. There are a lot of Bryce Alford haters in the Bruin fan community, and I am not one of them. He seems like a good guy, a smart player, and he tries hard. He obviously can shoot, and so far, he is their best distributor too, despite too many turnovers and attempts at flashy passes. But on Defense, his improvement has lagged behind. He is still getting beat off the ball repeatedly. You can really see the deficiency when he is back on Defense against a fast break. The ball handler almost always goes right around him like he isn’t even there, and it’s seemingly an automatic two points, if not three. 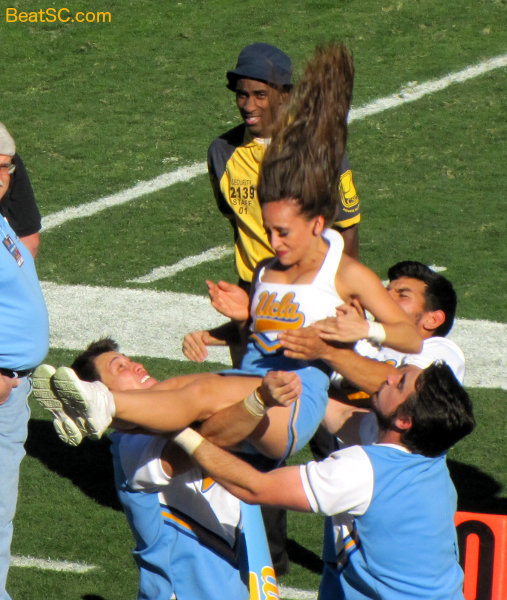 This dour report may get you down, but there is a TONIC for the CHRONIC negativity, and that is: PHOTOS OF THE UCLA SPIRIT SQUAD. 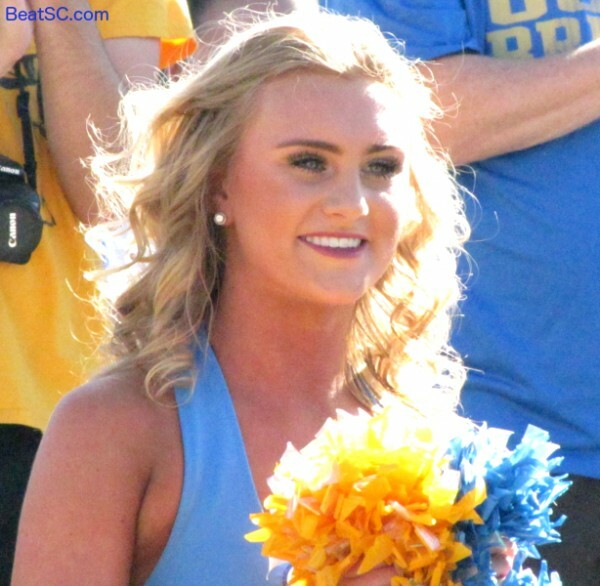 Here are 59 brand new shots from the most recent Football game. 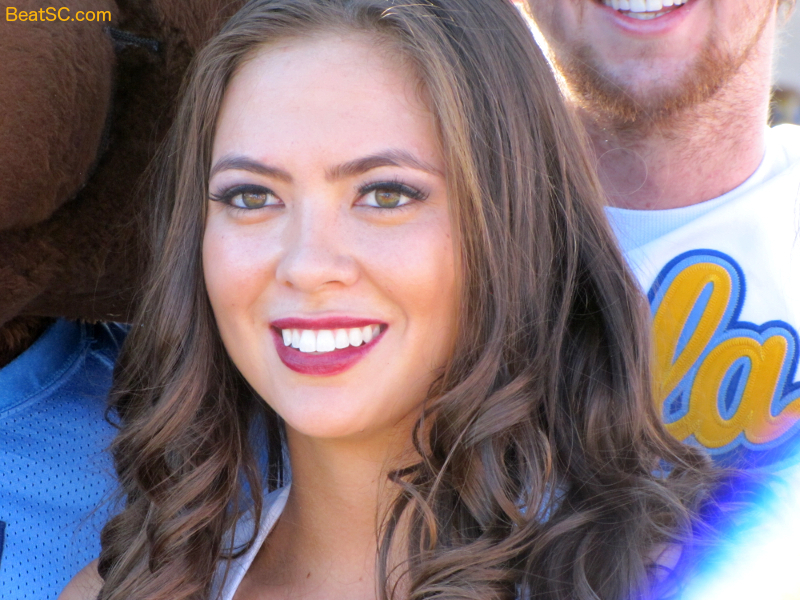 And I have a lot more, so even if I don’t take new shots at Pauley, I will keep posting more from the Rose Bowl, so keep checking in. Thanks, and, enjoy. "USE YOUR INSIDE BOYSSS" was published on December 4th, 2014 and is listed in Blue & Gold News, UCLA/usc/Cheerleader Photos. I think the Bruins can be better than you think, if they could just do one simple thing: make their damn free throws. If they had done that, they’d’ve defeated Oklahoma (and then probably Butler too), and would’ve been right there against an admittedly deeper UNC squad. And Arizona? All I’ve got to say about them is “Who’s the defending Pac 12 champion, Baby?” They were supposedly better than us last year too, but it didn’t matter. We’re still U C L A, and Arizona knows it. And if Looney finds his outside shot, the sky’s the limit.